Recorded Books, New York, 2007. 1 compact disc. 1.25 hours. It’s always fun to listen to a British narrator, and it was a treat to listen to Charlotte Parry talking about the exploits of Harriet’s detective aunts, Aunt Thessalonika and Aunt Japonica. In this book, Harriet learns that she has a sixth aunt she hadn’t known about, Aunt Formica. Aunt Formica grew up on a ranch in America, and is a skilled cowgirl, but she has asked her detective sisters for help, and Harriet gets to come along. The story is fun, reminding me of a traditional tall tale. I love Alexander McCall Smith’s stories, but do think he does a little better when he writes about places where he has lived. This story set in the American West struck me as highly stereotypical. I certainly hope none of his readers would ever try to deal with a rattlesnake in the way that happens here! All the same, this is a fun story and a quick read (or listen). This could be an excellent choice for a child just ready to read chapter books on their own. It’s not too long and daunting, but does have some excitement, as Harriet and her capable aunts deal with rustlers. First Second, New York, 2007. 205 pages. This acclaimed graphic novel tells the story of Laika, a special little dog chosen to be the first living creature in space. Laika’s life intertwines with many people — A former prisoner of the gulag who was promoted to Chief Designer in the space program, a little girl who loved the dog with the curly tail at birth, a boy who didn’t want responsibility for a puppy, a dogcatcher who resented the dog’s independent spirit, and an animal trainer who talked to the dogs at night before she went home. The book tells a sad story. It also makes you think. When is it right to sacrifice the life of a dog — for science, for country, for glory? I’m beginning to get used to graphic novels. This is a high-quality one and is a nice choice to begin learning the form and how it can tell a story. Candlewick Press, Cambridge, Massachusetts, 2006. First published in Australia in 2004. 266 pages. In fact, it turns out the man is not dead. He is an enemy soldier, having run away from the war. He cannot see. His eyes got tired of seeing the horrors of war, and his vision clouded over. Marcelle and Coco want to help their soldier. But how can two girls help a blind soldier? They start by bringing him food. 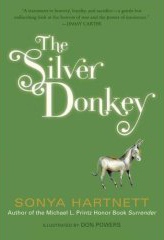 The soldier has a good-luck charm, a small shining silver donkey. He repays their kindness by telling them stories, stories of donkeys, which, though humble, turn out to be surprisingly noble. This book is mythic and powerful. It tells of the horrors of war, but also of the nobility that shines through in difficult times. And the wonder of friendship, across cultures. The library copy is in a wonderful binding with high-quality pages, silver decoration on the cover, and a silver ribbon bookmark. Illustrations by Don Powers grace its pages, with a special border on the pages of the stories the soldier tells. A simple and beautiful tale. American Library Association, Chicago, 1998. 196 pages. Here’s a great book for a new librarian, excited about beginning a profession and a calling — in fact, for someone like me! Harper Audio, 2007. 7 1/2 hours. 6 compact discs. 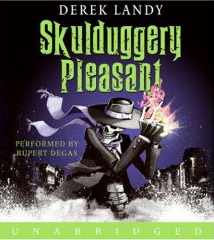 I would love to meet a well-dressed detective with a voice like Skulduggery Pleasant. The narrator does a magnificent job of making him sound tough and reliable and a hero to turn to when young Stephanie Edgely needs saving from deathly peril. His Irish accent is irresistible. When he turns out to be a living skeleton, we find we still want him on our side. Stephanie is plunged into a world of magic and ancient evil after her uncle’s death. She comes close to death countless times as she finds herself working with Skulduggery to try to save the world. This book is full of action and narrow escapes. The banter between Stephanie and Skulduggery is full of fun, wit, and affection. The magic world Derek Landy creates — the one that ordinary people don’t know about but goes on around us — is much darker and more sinister than Harry Potter’s. The villains here are truly evil, and there are some gruesome deaths. But most of all, this is a fun and captivating adventure yarn. The narration is completely magnificent, and found me wanting to linger in my car even after I’d reached my destination. The things that happen to people (in the past of the story and its present) are horrible and gruesome enough that I would save this book for teens and up. But for those who don’t mind a little grit in the story, I highly recommend this book. Better yet, listen to the audio version and enjoy the Irish accents! Living With the Passive-Aggressive Man: Coping with this frustrating miscommunication between women and men, by Scott Wetzler, Ph.D.
Simon & Schuster, New York, 1992. 207 pages. My husband used to freely admit to being passive-aggressive. In fact, I wasn’t very familiar with the term until he used it more than once to describe himself. Reading this book has been tremendously helpful in helping me understand how his wanting a divorce could have so completely blind-sided me. With hindsight, I can see the anger sitting below the surface. At the time, I believed the coverups. It also helps me keep from feeling jealous about any new relationships he might form: They will still have to deal with passive-aggression. A new woman won’t make it go away. And, best of all, it helps me know what to expect in my dealings with my husband as the divorce happens, and gives me the strength to opt out of any passive-aggressive games. This book is empowering. “The answer is simple: passive-aggressive behavior fractures relationships that would otherwise thrive…. “This book is for women like you, who deal with, live with, have been hurt by and have hope for this unique character: the passive-aggressive man. If you love such a man, then you know him as someone who never seems to love you back fully; he promises but rarely delivers. He sees himself as a casualty of recurrent misunderstandings, a bundle of intricately overlapping layers of behaviors no one can penetrate. What makes his personality confusing is that he’s passive, coaxing, elusive, but also aggressively resistant to you, to intimacy, to responsibility and reason. “Right now, confused by his behavior, you may be doubting yourself, not him…. But passive-aggression is an understandable psychological pattern — anger its driving force, and fear its hidden secret. As you read this book and recognize the pattern, you will be less confused by the passive-aggressive men in your life and the games they play. The ultimate success or failure of your relationship will be how the two of you willingly deal with his — and your — problems. Dr. Wetzler helps you understand what’s going on and helps you have the ability to opt out of the games. He also talks about what kind of women fall for passive-aggressive men, particularly Victims, Managers, and Rescuers. His explanation of our behavior is convicting and eye-opening, and he has ideas for stopping the cycle of behavior that feeds passive-aggression in the one we love. Not that we are responsible for this behavior — but he helps us see how we inadvertently feed it. “– A passive-aggressive man is responsible for how he feels, no matter how persuasively he denies those feelings rather than accepting them. “– A passive-aggressive man is in charge of the choices he makes, good and bad. The same is true for you. A helpful, enlightening, and empowering book. HarperCollinsPublishers, New York, 2007. 168 pages. Here’s the humor of Lemony Snicket, author of A Series of Unfortunate Events, without the depressing storyline. I’ve always thought his sense of humor hilarious — but get too thoroughly immersed in the story to really enjoy orphans with one dreadful problem after another. This book is a series of humorous insights on life ranging from a paragraph long to a page or two. I picked it up and soon was reading aloud from it to anyone I could find. And laughing more and more, the longer I read. Now, I don’t recommend reading this book in one sitting. That would be a bit much. But having it around to get a daily dose of laughter is a great idea. I found this to be a hilarious and utterly silly book. G. P. Putnam’s Sons, New York, 2008. 389 pages. Before Anne Shirley, the red-headed orphan, came to Green Gables, no one wanted her. She helped Mrs. Thomas, with all her children and a drunken husband, and then Mrs. Hammond, who had twins three times in succession, before she ended up in an orphanage. Before Green Gables tells the story of Anne’s first eleven years. I knew they were hard years, so I thought it would be a depressing book, but of course a hard-core fan of L. M. Montgomery can’t resist reading it. Although the book didn’t quite reach L. M. Montgomery’s genius, there were moments when I did feel the author had captured Anne’s soul and given us insight into how she might have become the jewel we see in Anne of Green Gables. I loved the picture Budge Wilson gives us of Anne’s parents, Bertha and Walter Shirley, two schoolteachers, very much in love with each other and with their new baby daughter. She portrays how the cleaning lady was touched by their lives — enough to take in their baby even when her own house was full. 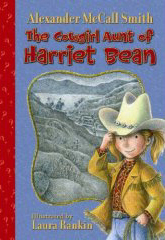 I like the side characters the author portrayed in Anne’s life, especially the Egg Man, who taught her to love words. I like the teachers she encounters who feed her soul, so hungry for beauty. Most of all, this book gave me a story of a girl who cherished transcendent moments and refused bitterness, in spite of a life of drudgery and hardship. Anne relished beauty and found friendship, even if only in a reflection and an echo. My own hardships seem small in comparison. Oh, to be like Anne, finding moments of beauty even when doing so takes great imagination. This book is a worthy addition to Anne’s legacy. You are currently browsing the Sonderbooks blog archives for March, 2008.